Expansion will depend on MWG's first foray into Vietnam's neighbor. The Mobile World Group (MWG) officially launched its first overseas store, “BigPhone” in Phnom Penh, Cambodia, on June 23, to approach Cambodians and visitors to the country and with a look similar to its stores in Vietnam. Initially, BigPhone will focus on mobile phones and tablets, which account for 85 per cent of all products in the store. Samsung phones and tablets are in the majority, followed by those from Huawei, OPPO, Camfone, and LG, while Apple and Nokia products will be available in July. The remaining 15 per cent are accessories and SIM and phone cards. Due to the low consumption in Cambodia, laptops will only be sold when other core products have generated stable revenues. The first BigPhone store is projected to earn average revenue of $100,000 per month. The launch of other BigPhone stores will depend on the business performance in the first three month of the initial store, which is currently being promoted by roadshows, leafleting, and other marketing activities. “The fake phone market in Cambodia is an issue, while the training of staff for long-term planning also needs to be considered further,” said Mr. Ho Viet Dong, CEO of MWG in Cambodia. BigPhone is a trial for MWG in seizing overseas opportunities and testing the company’s systems when operating outside of Vietnam. If things go according to plan, it will calculate the possibility of expanding into Myanmar or Laos, according to the company. MWG also signed a strategic partnership agreement on June 23 with the Hoang Anh Gia Lai Group (HAGL), a multi-sector group from Vietnam that engages in fields from agriculture to power generation, to provide fresh fruit to MWG’s Bach Hoa Xanh chain in Vietnam. This will bring the partnership between the two to the strategic level, with HAGL to accompany Bach Hoa Xanh’s nationwide expansion plans in the future. 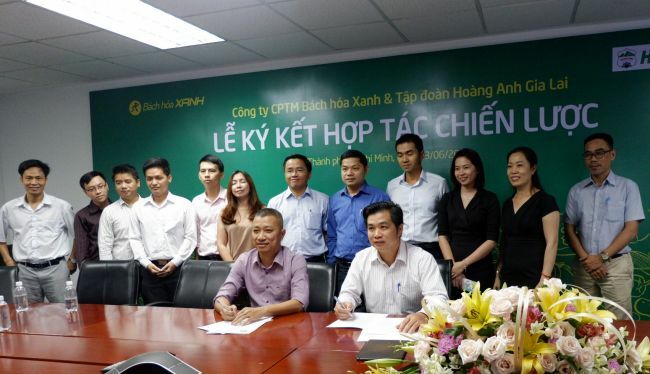 The partnership agreement makes clear that HAGL will prioritize Back Hoa Xanh over other exporters or local buyers while at the same time providing a preferential pricing system for Bach Hoa Xanh to ensure its market competitiveness. Speaking at the signing ceremony, MWG CEO Mr. Tran Kinh Doanh said he believes Bach Hoa Xanh will grow quickly in the time to come, and “our ambition is to grab a substantial share in the consumer retail market” and “we are glad to have HAGL as our companion,” Mr. Doanh added. For its part, HAGL CEO Mr. Vo Truong Son said that as of now the group has planted thousands of hectares of 17 types of tropical fruit in Vietnam, Laos, and Cambodia, which are all high-quality products. “We believe the Bach Hoa Xanh chain will create prestige within the consumer retail market and via this cooperation will bring our trusted products to consumers nationwide,” Mr. Son added. According to its 2016 financial report, MWG recorded net sales of VND44.6 trillion ($1.97 billion) and after-tax profit of VND1.57 trillion ($69.5 million), increases of 77 and 47 per cent, respectively, compared to 2015. Its revenue also exceeded the initial annual target by 14 per cent. Over the last five years, MWG’s revenue and after-tax profit have increased by 43.87 and 65.7 per cent per year on average.